Jurassic Park was one of the most popular and successful movie series in the world. Its unique story was only one of the reasons behind its great success. Due to the popularity of this movie and its stars, Microgaming has decided to build a free online video slots game that is themed around the story of the movie and its characters. The game was announced long ago, and it became one of the most anticipated slot machines and finally, it was released at Microgaming powered casinos. Since we like to offer our players the best games in the industry, we offer them the chance to enjoy this amazing game right here for free by placing demo credits. This way, players can enjoy the game with an unlimited number of spins so they can enjoy every feature and bonus that this game has to offer before they venture of to online casinos that offer the game with real money bets. This way, they can know what to expect whenever they have real cash on the line. This free online video slots game has 5 reels and offers a total of 243 ways to win, which is much more rewarding than the paylined format that most slot machines offer these days. So it is not only an immersive and a captivating experience that will take you to a dinosaur infested island, as it is also a high paying game that has plenty of winning chances and payouts. As the usual, players will be able to initiate the gaming experience by placing their bets and then spinning the reels. These bets are placed in their usual location under the reels. Players will see the bet cell that they can open by clicking on it to view the betting options that the game holds. Like most ways to win slots, the game has 2 wagering options that players can toggle through. The first one is the number of coins that players wish to place, while the other one is the amount of coins that they want to place. These betting options will create a wagering range that starts at 0.30 and ends at 15 credits per spin. The Auto Play function can be used at any time, whenever players place a bet, they can then choose a number of spins so they can kick back and relax and watch the reels as they spin until the specified number of spins is over, or whenever they feel like stopping it by clicking on Stop. There is an “Options” button that is found under the control panel through which players will control the different options of the game such as the sounds, the visuals and more. 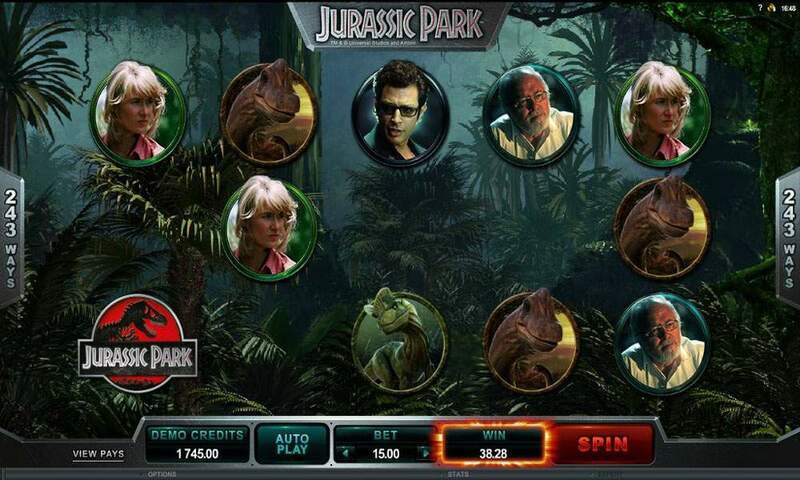 The entire interface of the game, the visuals and the symbols are inspired by the theme of the game, which is the events and the characters of the movie, Jurassic Park. 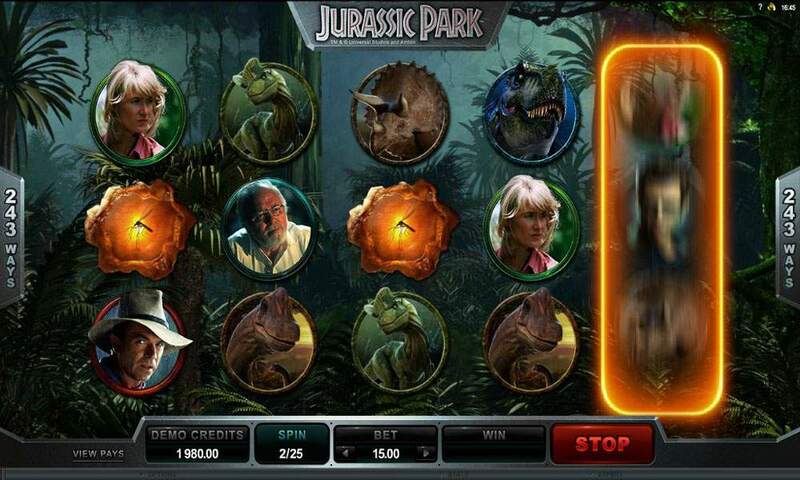 This is why players will see plenty of different dinosaurs spinning in the form of symbols on the reels of the game as well as other popular characters from the movie. All of the visuals of the game are of top notch quality which is not really a surprise given that the game is powered by none other than one of the biggest names in the industry, which is Microgaming that is well known for its high quality games that manage to create an immersive and a captivating gaming environment like none other. The game has a lot of winning opportunities because of its high paying 243 ways to win setup that offers players more chances of winning than the usual paylined formats that most video slot machine offer. Whenever players create a combo of symbols that has at least 3 similar ones on the same way to win, they will be entitled for a reward. The game also comes with a helpful wild icon, which is represented by the logo of the game icon that can replace any of the other icons of the game in order to help players in achieving a winning combo. 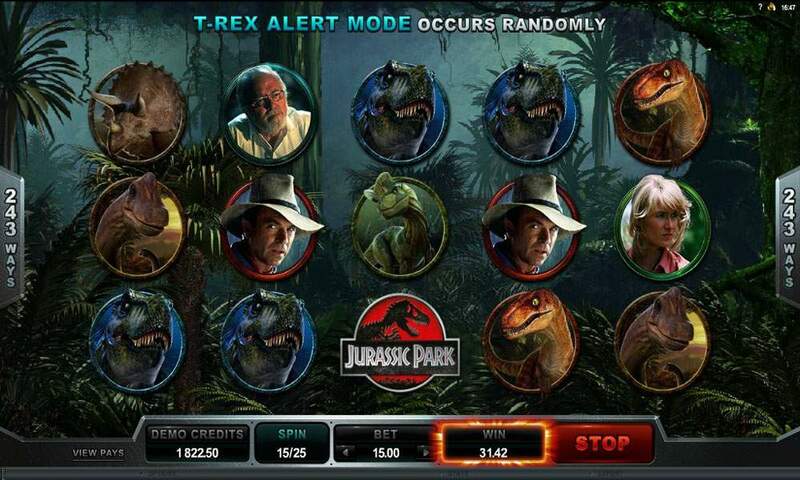 There is also the scatter icon, which is the dinosaur fosill that can give scatter pays as well as trigger the free spins round of the video slot machine that can give players up to 25 free spins. Players can view all of the game’s rewards, special features and bonuses at the paytable of the game when they click on the View Pays button.